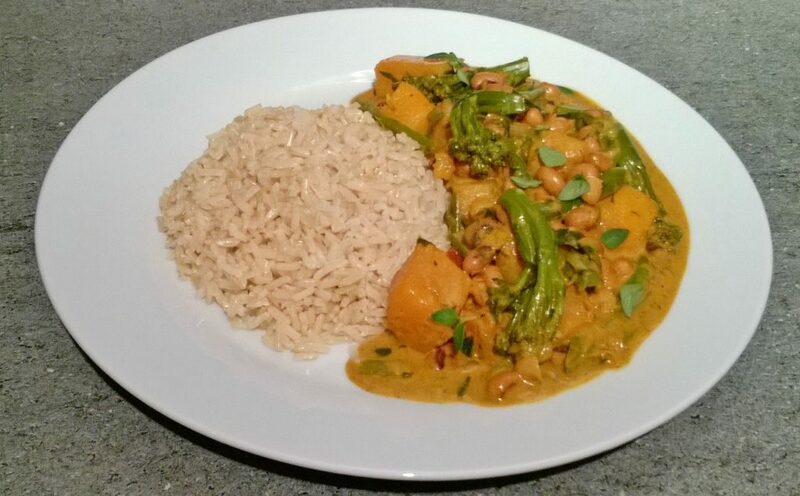 This is a delicious aromatic mild curry which can be enjoyed by anyone, even those that are not keen on ‘hot’ food. 1 Cook the rice according to the packet instructions. 2 Heat a large wok or pan on a medium heat and add the coconut oil, when the coconut oil melted add the red onions, yellow peppers and red peppers and stir then add the garlic and scotch bonnet pepper and stir. 3 After a minute add the curry powder, fresh turmeric, paprika and ground cumin stir after 30 seconds add 1 tbsp water, stir and cook for 1 minute. 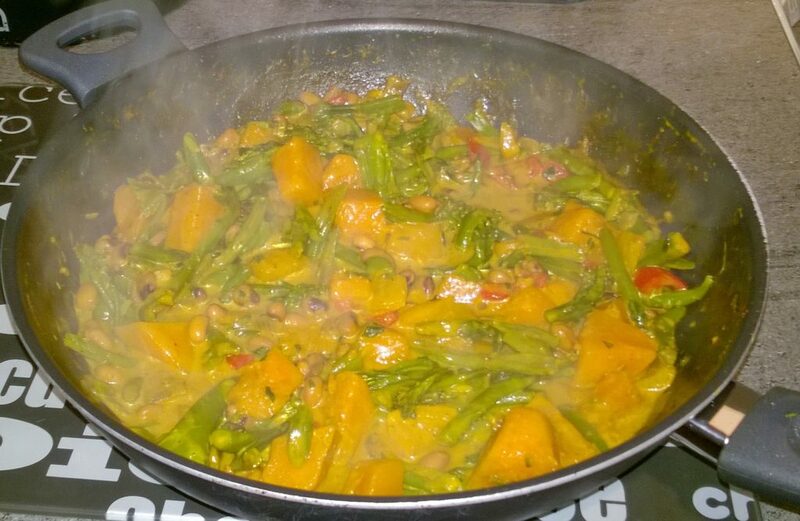 4 Then add the butternut squash, tenderstem broccoli, green beans and add the remaining water and coconut milk then stir and place the lid on and leave to cook for 10 mins stirring occasionally. 5 After 10 mins stir and add the black-eye peas, the fresh thyme and cracked black pepper stir and leave to cook for 5 mins with the lid on stirring occasionally. 6 Then remove the lid and cook for another 5 mins. 7 When the rice is cooked serve up the rice and the curry and garnish with thyme. Enjoy! Tip: This is a mild curry, if you would like it hotter you can add more chillies and a hot curry power. Whole grain brown rice is a source of fibre which helps you feel fuller for longer. They are high in vital nutrients such as vitamin-B1, magnesium and potassium, which is good for a healthy heart and skin. Black-eye peas are from the legume family which is the same as lentils and a source of plant protein and can aid weight loss. They also contain vitamin-B, vitamin-E, iron, fibre, potassium and zinc which is good for your eyes and sight.